The European Union really has it in for Microsoft and has just fined them $1.35 billion euros, bringing the total amount of Microsoft fines in Europe to approximately 1.7 billion E or $2.55 billion dollars. This is a staggering amount, which equates to about $2.75 per european citizen. This is only about 2 weeks of MS operating profit, but still it is a huge amount. Personally I am torn over this decision – while I dislike Microsoft corp with a passion, Neelie Kroes the EU antitrust chief may be overstepping her authority. Thanks for TechCrunch for the image and inspiration for this post. 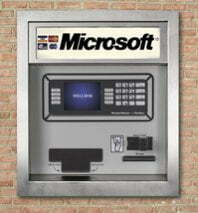 Microsoft may be feeling like the rich husband of an overspending wife who continues to use him as her personal ATM machine. That is great! hahaha Microsoft search is funding the EU web.